Use tax is a tax that you have to pay if you purchased a product or service and did not pay any sales tax. Generally, this would apply to online or out of state purchases. Unlike sales tax, it is the buyer’s responsibility (not the seller’s) to calculate, report, and remit use tax to the appropriate state and local tax authorities. To reduce the complexity that sales and use tax can bring, I suggest that you use an accounting software program like QuickBooks to help you keep track of sales tax collected from your customers. Click here to receive up to 50% off. When Should You Charge Sales Tax? In general, you are required to charge sales tax on all products and services purchased by your customers. Since sales tax is regulated by each state, products and services that are taxable in one state may not be taxable in another. That’s why it’s important for you to find out what goods and services are taxable in your state. To look up the sales tax rates by state, you can see the list here. There are a few products that are generally not subject to sales tax for most states. Food sold for consumption, prescribed drugs and electronic downloads of music, books, and games are generally not taxable. In addition, items that are purchased for resale, raw materials purchases, and items sold to non-profit organizations are generally not taxable in most states. However, since the rules vary by state, you must find out what products and services are taxable or exempt in your state. In case of a sales tax audit, you must be able to provide documentation to support why you did not charge sales tax to a customer. 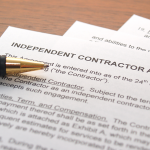 Therefore, be sure to get a copy of the buyer’s tax-exempt certificate or number and keep it on file for your records. Take a look at a sample resale certificate for a fictitious business here. The most common type of exemption that you can get a tax-exempt certificate for is a resale exemption. You may qualify for a resale exemption if you purchase goods that will be sold in the same condition that you purchased them in. For example, if you purchase several cases of coffee mugs from a vendor to be sold in your coffee shop, then you do not have to pay sales tax on these coffee mugs if you plan to sell them as is. However, you must charge sales tax to customers who purchase the mugs from you. To apply for a sales tax exemption and get a buyer’s tax-exempt certificate, you can find a list of forms that need to be filed by state, here. How Much Sales Tax Should You Charge? This is the million dollar question! Even if you have just one location, you may be required to collect tax for multiple jurisdictions such as state, county, and city. These rates vary and change quite often which makes it difficult to keep up with. If you have out of state sales, that just adds another level of complexity. We will discuss how to deal with out of state sales later on in this article. Origin – If the origin method is used, you will charge sales tax using the rules based on your business location. In general, most sales that take place within the same state will use this method to determine the sales tax to charge customers. Destination – If the destination method is used, you will charge sales tax using the rules based on your customer’s location. This method is generally used for interstate sales. One of the great things about living in the technology age is we have the power to buy and sell products and services right from our smartphones. As a result, consumers are now buying more things online than in retail stores. About 190 million U.S. consumers—more than half the population—will shop online this year, according to Forrester Research, as reported by the Wall Street Journal. While more sales is what you want if you’re in the business of making money, it has become increasingly difficult to determine whether or not you should charge sales tax to customers who are out of state, how much to charge them, and which tax authority to send your payments to. If your business has a physical presence in a state (known as a nexus) then you MUST collect sales tax from customers in that state. A physical presence can include a store or office, a warehouse, having remote employees who live in the state, or other criteria defined by your state. If you don’t have a presence (nexus) in a state, then you are generally NOT required to collect sales tax. Products and services that you do not charge sales tax for will be subject to use tax. Use tax is the buyer’s responsibility. We will discuss how use tax works later in this article. For more information on the internet sales tax regulations for your state, check out this guide. You are required to file an application to collect and report taxes before you start doing business in that state. Sales and use tax registration processes vary from state to state. Sales taxes should be remitted to a single state agency. This means that businesses should not have to file a sales tax return in each jurisdiction where they do business. For example, if you do business in the state of Nevada which has 17 different counties that charge sales tax; you can report the sales tax collected from all 17 counties on one sales and use tax return. Payment for all counties can be made with one check and sent to the Nevada Department of Taxation. Each state is required to have their jurisdictions tax goods and services in the same way within each state. The same tax rates are applied across a state’s tax jurisdictions with the exception of food and drugs. For sales made within a state, the origin sourcing rules, discussed previously, should apply. For interstate sales, the seller is expected to use destination sourcing rules, and collect the statewide sales tax rate for the destination state and remit payment to that state. Let’s say that your office is in California but you have a nexus in Texas. Any sales made to customers in Texas must be charged sales tax using the Texas state tax rate. This keeps things simple because if you sell in multiple counties (in Texas) that charge different rates you are not required to use the rate in the jurisdiction(s) where you made the sale but instead use the sales tax rate for Texas. To see if your state has adopted this agreement, you can see the list here. If your state has not adopted the streamlined sales tax agreement, then you can find a list of forms that need to be filed by state, here. The money that you collect as sales tax should be kept in a separate bank account until it is time to send it to the tax authorities. Each state will require you to file a sales and use tax return, and you will remit your tax payment with that form to the appropriate government agency. The deadline for filing the return and submitting payment can vary from one state to another, and the government agency that manages sales tax will also vary by state. To give you an idea of the variations by state, below is a sample chart of 5 different states along with the number of filing types and the government agency that is responsible for managing sales tax in each state. Check our map to find your state tax agency and learn more about sales tax requirements. If you purchase something for your business or personal that you use, give away, store, or consume in your home state without paying sales tax, use tax kicks in. If you purchase something in one state and then bring it back to your home state without paying sales tax. For example, if you found a great deal on some supplies that you need for your food truck business while on vacation in Texas and the vendor ships them to your business in Los Angeles. If you buy something from someone who is not authorized to collect sales tax (and does not collect sales tax), such as buying a used food truck from someone on Craigslist. If you purchase something online without paying sales tax. Any item that would typically be subject to sales tax would be subject to use tax if sales tax isn’t collected. As we mentioned earlier, items that are not subject to sales and use tax are food, prescribed medications, electronically downloaded software, music, and books and any products that are purchased for resale. If you owe use tax, you can use the sales tax rate that would apply in your home state to calculate the amount of use tax that you owe. For example, if your sales tax rate is 7% then you would use this same rate (7%) to also calculate your use tax for any items that you purchased and did not pay sales tax on (assuming you did not have an exemption). You must report and pay use tax in the same manner that you report and pay sales tax. 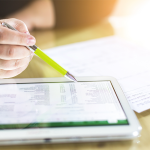 There are a couple of great software programs that can help you to keep track of your sales tax: QuickBooks, which is our recommended accounting software program, and Avalara which is an end to end sales tax management software. We will discuss the benefits of using each of these programs next. QuickBooks will not tell you how much sales tax to charge your customers however. For that, you need sales tax management software like Avalara. If you’re in the market for an accounting software that can help you to manage other aspects of your business like paying bills and invoicing customers, check out our free QuickBooks Course. This is a self-paced course with both video and written instructions. You can be up and running in no time! Calculate sales tax rates using geolocation and address verification tools. Evaluate whether or not you are exempt from sales tax. Collect sales tax and then remit to the appropriate tax authorities. Automatically update rate changes in real time. The best part about Avalara is that it will integrate with most accounting software programs like QuickBooks. Pricing for the QuickBooks/Avalara integration starts at $50/year. You can learn more about how Avalara integrates with QuickBooks here. Sales and use tax is one of those areas that you want to comply with in order to avoid interest, penalties, and fees due to non-compliance. To reduce the complexity that sales and use tax can bring, I suggest that you use an accounting software program like QuickBooks to help you keep track of sales tax collected from your customers. 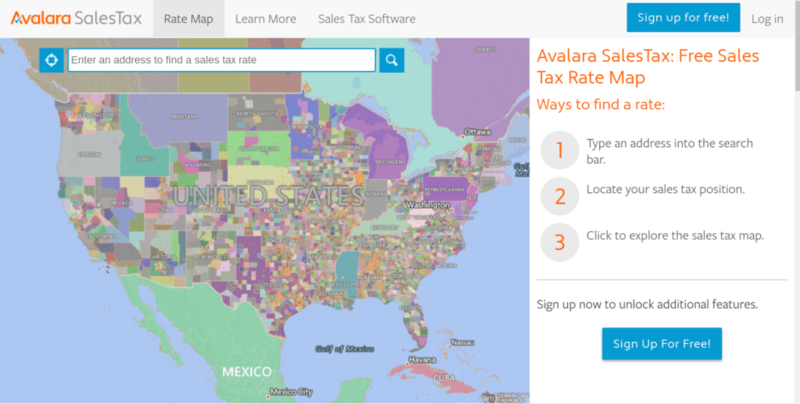 For the most up to date sales tax rates and access to tools that will help you determine which tax jurisdictions you are responsible for collecting sales tax in, be sure to check out Avalara.